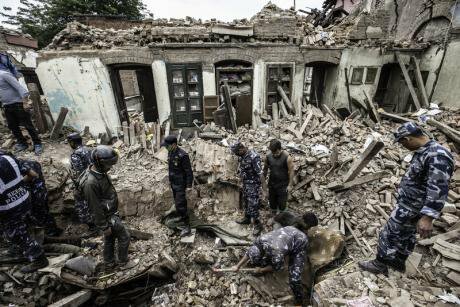 Rescuers dig through the rubble, 17 April, 2015. Demotix/Thomas Kelly. All rights reserved.It’s been one week since a 7.8-magnitude earthquake and subsequent aftershocks struck Nepal. The death toll has now passed 6,600 and will almost certainly reach 10,000 or more, as information trickles in from the rural areas. More than 14,000 people are injured and this number will also rise. The earthquake has caused a national catastrophe, with heart-rending destruction and untold suffering.